Guadalupe Island History | Great White Sharks, Seals, Goats and Gold! Guadalupe Island is more than just great white shark diving. Its remote location in the Pacific has made it a unique biological laboratory for wildlife and history. The island has been visited by over 100 scientific expeditions since 1850. In 2000 the MV Horizon was the first vessel to cage dive with great white sharks at this location and we have been fascinated by it ever since. Here are some incredible facts about the island that you probably didn’t know, but we took the time to uncover, in unlikely places like the U.C Berkeley Archives and Archivo General de la Nación. Over all the decades of writing and of research expeditions to Guadalupe Island there are no mentions great white sharks at the island, which we found odd, as seal hunting occurred for over 200 years and was practiced from small boats from June through February in an area called Pointe Norte, also known as the modern white shark cage diving location at Guadalupe Island. Enjoy! Earliest mentions of Guadalupe Island by Russian and US fur seal traders. The island is covered in two species of seal that are being depleted along the Alaskan and California coastlines. For the next 200 years Guadalupe Islands endemic fur seal (Arctocephalus townsendi) and Elephant seal (M. angustirostris) fall under increasing pressure. From 1876 – 1894 an estimated 5,575 fur seals are killed leading to a near extinction of the entire species. The 1800’s are turbulent years for Mexico. Independence from Spain, a war with the US, and successive revolutions leave Guadalupe Island unrecognized and open to biological looting by anyone with a vessel, a few gold coins, and a sense of adventure. Sealing is rampant during this period with well documented sealing totals and decline over the next 100 years. To put this time period into perspective, by 1845 in the USA, many states had yet to join the union and Alaska was not purchased from Russia until 1867. Isla Guadalupe was ceded from the Mexican Government in a murky business deal to Jose Castro and Florencio Ferrano, both Mexican citizens, on January 8th, 1839. They received not just Guadalupe island but all the smaller islands in the region as well. They owned the rights to the entire region then covered in a healthy cloud forest, with declining seal populations. By 1845 Jose Castro had sold 50% of his stake in the islands for the princely sum of $500 in gold. The transaction and ownership title remained murky by even standards of the 1800’s – think Gangs of New York time period. To this day no one knows who they purchased the island from originally. By 1870 the islands were finally sold to US interests making Guadalupe Island a privately held US property. Soon after, the formation of The Western Livestock Company in the State of Maine lead to The Guadalupe Island Company and the selling of stock certificates seeking a total capital of $500,000. Stocks in the newly formed Guadalupe Island Company were sold in San Francisco until 1885. By 1873 Guadalupe Island, a biologically sensitive outpost in the Pacific, is covered in an estimated 30,000 goats. Forests on the island cover an estimated 6000 acres of commercially viable white pine and cedar. The Guadalupe Island Company gets to work harvesting the timber and remaining seals. The company also builds a small church at the seal harvesting site also know as Point Norte, or as we now know it, white shark beach. 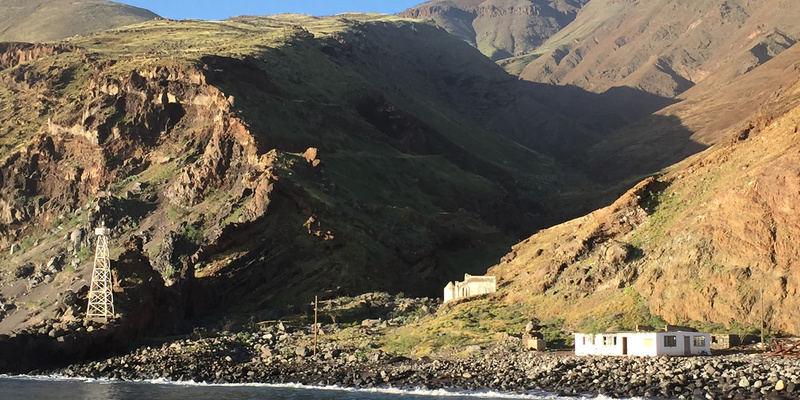 New York based Forest and Stream Magazine writes an incredible story about Guadalupe Island detailing the efforts of the Guadalupe Island Company to raise sheep and goats. The picture painted of the island then filled with endemic tree species and a cloud forest contrasts with the stark desert like environment of Guadalupe Island today. The Guadalupe Island Company posts its first recorded advertisement for sheep wool, meat, and products across the United States. The company offers ownership for $50 a share and claims they have 35,000 head of goats on the island. The imported and now wild goats have become an ecological disaster by this time, destroying endemic bird nests and habitation, and radically altering the fragile landscape. This ecological disaster will last well into 2008 until Mexico and a series of NGO’s start an eradication campaign. Mexican Consul-General Juan N. Navarro sends a letter to the owners of The Guadalupe Island Company now based on California demanding, “You appear before us in Baja to explain how you acquired Isla Guadalupe.” Shortly after The Guadalupe Island Company disbands and the island officially becomes part of Mexico. By 1894 the Mexican Government places an armed island caretaker to protect the last remaining colonies of Guadalupe Fur Seals at Point Norte. First recorded conservation measure by the Mexican Government at Guadalupe Island. Numerous Guadalupe Island taxa have gone extinct due to the habitat destruction by the goats, which in turn rendered the endemic fauna vulnerable to predation by introduced cats and to adverse weather by depriving them of shelter. In 1910 the Guadalupe storm petrel (Oceanodroma macrodactyla) is declared extinct. Seal colonies once abundant hang on at Point Norte. Isla Guadalupe becomes a commercial Bluefin tuna fishing hub for long range vessels from the US and around the globe. Tagged Bluefin at Guadalupe in 1958 show up in Tokyo’s fish markets in 1959 highlighting some of the first trans oceanic migrations for this unique species. Isla Guadalupe Bluefin decline but long range fishing vessels from the US still fish yellowfin tuna. The 1970’s see the rise of personal long range fishing trips, and a new era of fishing begins as individuals charter vessels to take them to destinations far from the coast. Mexico declares Isla Guadalupe the first Pinniped Sanctuary in a bid to preserve the endemic fur seal (Arctocephalus townsendi) and Elephant seal (M. angustirostris) populations. Late in the 1990’s spear fishermen from California report seeing and encountering great white sharks at Isla Guadalupe. The first expedition on the MV Horizon out of San Diego is chartered in 2000 with the hopes of seeing a single white shark. Until that time the only places on the planet you could dive with white sharks was South Africa and South Australia. The expedition is an amazing success, and the era of cage diving with great white sharks at Guadalupe Island is born. Within a decade there are 10 vessels coming to the island and it becomes the top white shark destination in the world. After many years of false starts, the Mexican Government completed a round up and evacuation of the remaining goat population. Guadalupe has been designated a Biosphere Reserve. White shark research, tagging, and tracking begins in earnest with a collaboration between CICIMAR and UC Davis lead by Dr Mauricio Hoyos. White shark cage diving grows from one single vessel, the MV Horizon, into a fleet of over nine vessels. Horizon Charters continues to support Guadalupe Island conservation efforts. Not only do we provide the platform for marine researchers from Mexico and the United States but we work with the local fishing Cooperativa, giving them logistical support for their complex ecosystem and biodiversity on the island. Horizon Charters is dedicated to working with the Mexican Government to preserve the ecological treasure of Isla Guadalupe beyond great white sharks.